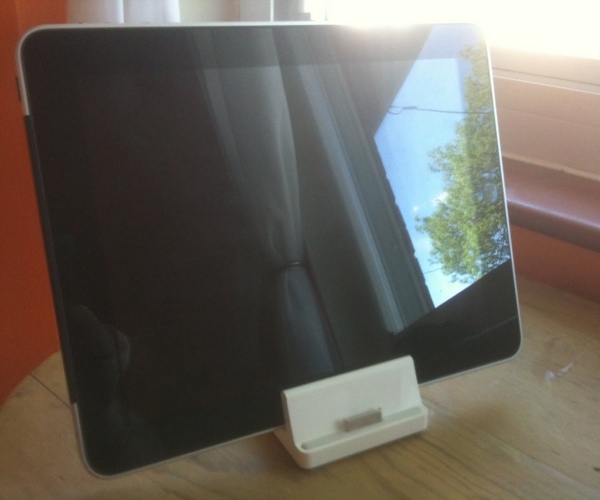 Future iPads to feature landscape docking? Yes, please! Patently Apple has found some rumored future iPad designs that surfaced in China last week that seem to clearly show that future iPads may have landscape docking. This is certainly a rumor at this point, but if true would certainly be exciting for iPad enthusiasts. Landscape docking makes perfect sense – frankly, we didn’t buy the dock mainly because of the lack of a horizontal option (went with the Bluetooth keyboard instead). Also, horizontal docking would allow users to watch video correctly when docked, which would also be a huge plus. There is also an unidentified image in the bottom-left-hand-corner of the iPad in the new patent images. What could this be? Patently Apple seems to think that it could be a “smart bezel” that might perhaps function as a page turner for ebooks. Our first impressions? Well, maybe it is some kind of sensor (the wavy lines kind of suggest that) or maybe a fingerprint scanner for security (again, wavy lines). Heck, maybe it’s a speaker? All of these are simply wild guesses – frankly, it could be anything (and we’re not even sure if there would be room for a speaker).